Expanding your choice of lenses when working with the Fujifilm GFX mirrorless camera, this Laowa Magic Format Converter MFC from Venus Optics enables you to use Nikon F-mount full-frame lenses with the Fujifilm G-mount medium format camera. 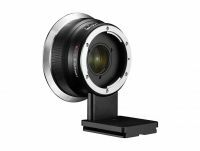 Differing from a conventional, simple adapter, this sophisticated manual lens adapter employs an optical system to expand the image circle and magnification by 1.4x in order for the full-frame lens to cover the larger 44 x 33mm sensor of the GFX system. This optical system also helps to effectively prevent vignetting and maintains the optical clarity and sharpness of the original lens. Enables the use of a full-frame Nikon F-mount lens on a Fujifilm G-mount (GFX) medium format mirrorless camera. 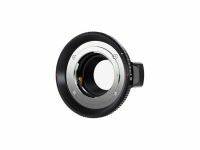 Expands the image circle and increases the magnification of the lens by 1.4x in order to cover the larger 44 x 33mm sensor without vignetting. The increased 1.4x image magnification requires one additional stop of exposure for normal results. Manual adapter does not transfer electronic signals from the lens to the camera and requires the use of manual focus and manual aperture selection.